All over America retailers are going bankrupt and closing stores. Of course this has been happening for years, but as you will see below the numbers have dramatically escalated during the early portion of 2019. Our landscape is already littered with countless numbers of hollowed out stores and abandoned malls, and it is about to get a whole lot worse. Bankruptcies also are continuing at a rapid pace "with the number of filings in the first six weeks of 2019 already at one-third of last year's total," the report states. It is going to take some time for this drama to fully play out. Just look at Sears - it is a money bleeding zombie of a company, but Eddie Lampert has convinced investors to give things one more try. But they are going to zero, and so is JC Penney, and so are a whole host of other major retailers. I thought that the U.S. economy was supposed to be "booming". Isn't that what they have been telling us? No, everything is definitely not "just fine". People are going to realize that we checked into the monetary roach motel that I talked about from the beginning and that there's no way out, and then the dollar is going to fall like a stone. When they find out that it's never over and it didn't work, then there's going to be nothing propping up the dollar and it's going to drop like a stone, the price of gold is going to take off, and the recession that we're entering into, which is going to be an inflationary recession, is going to be worse than what we now call the Great Recession. Maybe it's taken longer than we might have thought to play out, but this is the beginning of the end." I wish that I had better news for you today, but I don't. 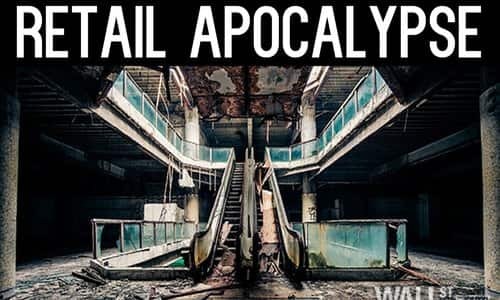 The retail apocalypse is accelerating, America's debt crisis is starting to reach a critical level, and very challenging days are approaching for all of us.